J.R. Martinez entered the Army in 2002 and was deployed to Iraq in 2003. Two months into his deployment, the Humvee he was driving struck a landmine. He suffered severe burns over 40 percent of his body. He recovered in Texas at a military hospital, where over the course of over two years he underwent over 30 surgeries, including skin grafts. At the urging of a nurse, Martinez began to share his story with other patients, and ultimately, he became a motivational speaker, eloquently using his expriences to help and inspire others. He answered the call when AMC sought to cast the role of Brot with a real-life vet, but remains active in charity work alongside his Pine Valley duties. J.R. stands for Jose Rene. It was Martinez's decision to start going by J.R.
As a high school senior, his football team (he played strong safety) went to the Georgia State Championship. He has a tattoo honoring his mother, sister, and late sister. His beloved dog is named Romeo. His mom watched AMC while he was growing up, and introducing her to her favorite actor, Michael E. Knight (Tad), is a moment Martinez says he'll never forget. According to Radar Online, J.R. Martinez (ex-Brot, AMC) and girlfriend Diana Gonzalez-Jones, who share an infant daughter, Belle, have split. 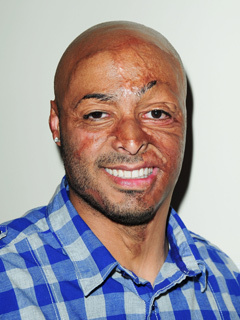 J.R. Martinez (ex-Brot, AMC) is returning to TV after his victorious run on DANCING WITH THE STARS. J.R. Martinez (ex-Brot, AMC) and his girlfriend, former AMC administrator Diana Gonzalez-Jones, became first-time parents on May 2 with the birth of daughter Lauryn Anabelle Martinez. J.R. Martinez Prepares For New Role: Daddy! J.R. Martinez (ex-Brot, AMC) and his significant other, Diana Gonzalez-Jones, are expecting their first child, a girl, this spring, they confirmed to People. J.R. Martinez (ex-Brot, AMC) won the hearts of the nation with his spirit and his dancing skills and last night, with partner Karina Smirnoff, won the coveted trophy ball on ABC's DANCING WITH THE STARS. J.R. Martinez (Brot, AMC) hasn't let the grass grow under his feet as he's danced his way into hearts on DANCING WITH THE STARS this season, and now he can add "grand marshal" to his blooming resumé. J.R. Martinez (Brot, AMC) will follow the fancy footsteps of AMC-ers Cameron Mathison (Ryan), Susan Lucci (Erica) and Aiden Turner (ex-Aidan) on ABC's DANCING WITH THE STARS, joining the cast of its 13th season. J.R. Martinez to DANCING WITH THE STARS? J.R. Martinez (Brot, AMC) may follow the fancy footsteps of AMC-ers Cameron Mathison (Ryan), Susan Lucci (Erica) and Aiden Turner (ex-Aidan) by joining the cast of ABC's DANCING WITH THE STARS.